An eye witness account of the translocation of rhinos carried out in Assam between 27-29 Dec 2010 and 17-19 Jan 2011. Note: An edited version of this was first published as a special feature in the Jan-March 2011 edition of Panda. It is 5 am on a Tuesday morning, towards the end of 2010, and a thick fog conceals the vast grasslands of the Pobitora Wildlife Sanctuary, located about 60 km east of Guwahati. I’m on the back of an elephant, for the first time in my life I should add, sitting behind the mahout and hanging on for dear life with one hand while trying to shoot with a video camera with the other hand. We are following three elephants, each of which has one veterinarian equipped with a tranquilizing gun. Much ahead of them, lost in the gloom of the fog, is the locator team. Waiting behind at the elephant camp is the logistics team along with forest department officials and guards, WWF and other NGO staff as well as a host of other support staff. 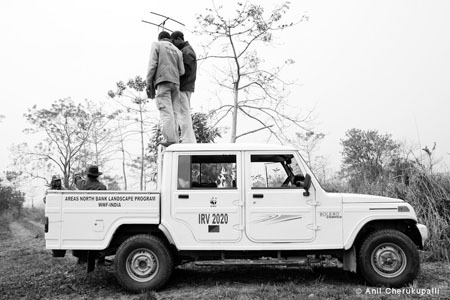 All of them are part of the team tasked with translocating rhinos from Pobitora to Manas National Park in northern Assam under the Indian Rhino Vision 2020 (IRV 2020, see below). The sun is still not up but a faint glow suffuses the fog. An occasional bird call and grunts of the elephants disturb the stillness of the early morning. I slip into a pleasant limbo induced by the gentle rocking of the elephant. But it does not last long. A burst of static shatters the stillness. The locator team is contacting the veterinarians through the wireless. And they have some good news. They have found a couple of rhinos and apprise the team of the location. We rush together into the fog. By this time the sun has risen and is a pale disc hanging low in the sky. Suddenly, a little ahead of us, a silhouette resolves itself into the thick outlines of a rhino. Behind it is another rhino. The elephant I’m on falls back a little while the elephants of the tranquilizing team take up a triangular position to box in the rhino and enable correct targeting. 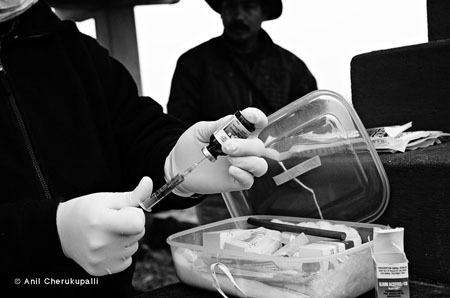 Each tranquilizing gun is loaded with a diluted solution of the powerful narcotic-Etorphine. I’m told one undiluted drop of which if exposed to bare skin is capable of killing an adult human within minutes! However, the rhino doesn’t play to their plan. It quickly cuts through the fourth side before the doctors can take proper aim. We follow him and there begins a fruitless chase that lasts more than an hour and a half. By this time the sun has climbed the eastern sky. The fog has also cleared improving visibility. The tranquilizing team decides to leave this unsporting rhino alone and they move to a different location with the locator team. I return to the base camp to join the remaining translocation team there. I’m actually grateful for the chance to dismount the elephant, even if it was an enjoyable experience, as it was not easy shooting with one hand while hanging on to only a rope with the other hand. The locator and tranquilizing teams then move off to a new location in another part of the sanctuary in the hopes of having better luck at finding rhinos. But little did they know that their luck would stay rotten until early afternoon. After a series of near misses, partial hits and uncooperative rhinos the tranquilizing team finally meets with success and manages to tranquilize a female. The rest of us rush to the new location to find the rhino tottering with her concerned calf hovering nearby. A decision is taken to tranquilize the sub-adult rhino also as it is a female too and more importantly would keep the mother and her calf together. The mother quickly falls asleep and the logistics team swings into action. 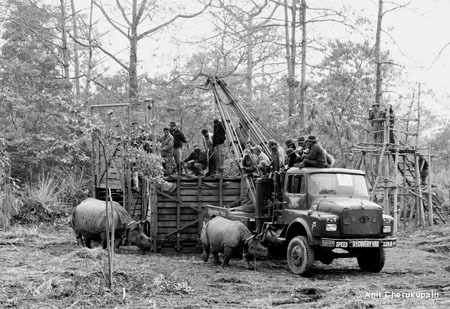 A bulldozer is brought in to dig a shallow trench next to the tranquilized rhino so that a platform can be placed there onto which the rhino can be rolled. This is soon accomplished. Meanwhile, the doctors conduct a quick examination of the rhino including measuring its length and breadth, taking a blood sample and clipping a piece of the ear for later identification. 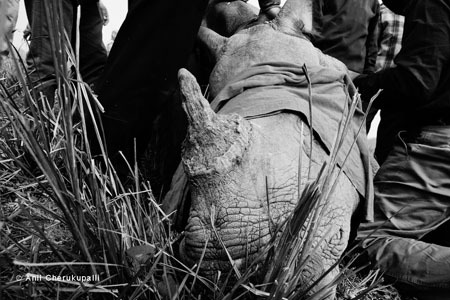 A radio collar with a GPS locator is affixed around the neck of the rhino to facilitate tracking of the rhino post-release in Manas. After the examination, the rhino is rolled onto the platform and the bulldozer then moves the platform to where the crate that will be used to transport the rhino is located. 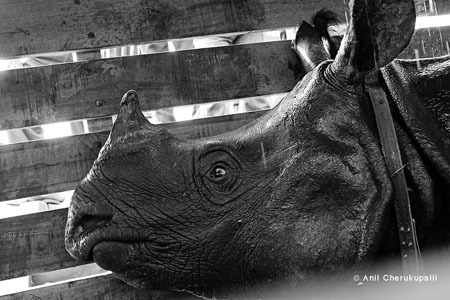 Next, a carefully coordinated exercise is undertaken which first involves bringing the rhino into the crate with the platform followed by administration of the revivant and removal of the platform once the rhino is awake to fully close and lock the crate. An exercise that involves at least 20 people, two bulldozers and ropes and chains to execute in the correct way. 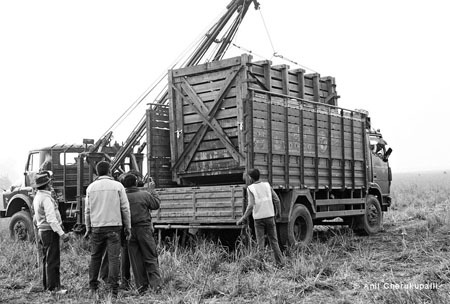 A crane is then brought in to carefully raise the crate and lower it onto a truck. Throughout this whole operation the rhino is watered at regular intervals to keep it cool. The same sequence is repeated for the sub-adult female as well. 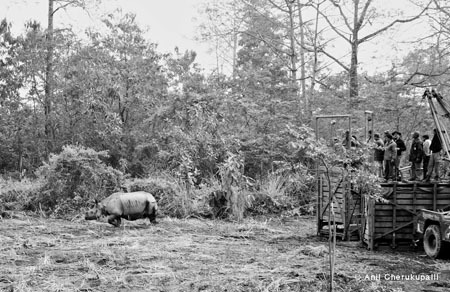 Once the rhinos have adjusted to the crates we retire for a quick lunch and a trip back to our rooms to pack our luggage. It is time now to start the long road journey through the night to Manas National Park, located about 260 km away in the north of Assam. The convoy starts with a police van in front providing security followed by the trucks with the rhino crates behind which the various other vehicles such as the veterinarians and us follow. Except for a temporary breakdown of one of the rhino trucks and the crane driver getting lost and finding the rest of the convoy again the journey through the night passes off uneventfully. We reach Manas just as dawn is breaking at around 5 am. Everything is ready. Two ramps have been hollowed out for the trucks to facilitate the release of the rhinos. Everyone takes a short break as the trucks make their way to the release site. The release site is a small clearing in front of dense grasslands. The trucks are in place. The post release rhino monitoring and tracking teams are ready on elephants nearby. We make our way to one of the machans set up next to the release site to observe and record the proceedings below. The crates are then lowered from the trucks by the crane. The doctors do one last check of the rhinos within. They seem to be fine and look ready to get out and explore their new home. People are cleared from the site. It is time. 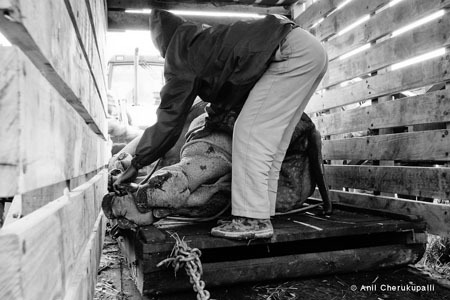 First, the gate of the crate containing the calf is raised. She comes out, understandably a little miffed at being confined in a crate for the night. So she tries to bite the truck. She then turns around and runs to her mother’s crate, which is also being raised. The calf passes in front of the mother and veers off. However, in the heat of the moment and since rhinos have poor eyesight, they both miss seeing each other and the calf vanishes into the jungle. The released mother instantly goes over to her daughter’s cage. She then wanders over to some feed from her daughter’s cage kept under a machan. There are about 10 people on the machan including me observing and recording the proceedings. She is huge and fills the viewfinder of my video camera. For a moment I’m stunned as the sheer size of the rhino belatedly hits me. Quite literally, as if reading my thoughts, while turning away from the machan the rhino below us does hit one of the wooden pillars of the machan with her side. The whole machan is rattled and sways but fortunately for all of us the rhino moves forward and the machan stays. The rhino is presumably following the smell of her calf as rhinos have an excellent sense of smell, better than their eyesight. The rhino then moves to the truck of her daughter again but this time approaches the driver’s window. The poor driver inside is shocked to suddenly find this huge rhino filling up his window. He shrinks back and the rhino disturbed by his sudden movement also moves away. Now, some colourful plastic chairs placed a little distance away from the release site attract her attention. She charges them and plays the rhino version of football with them, shattering a few chairs instantly in the process! She soon settles down though and veers off into the adjacent grasslands and eventually into the forest. The post-release monitoring and tracking team soon sets off on elephants after her to track her by her GPS radio collar and check if she has united with her calf. We all heave a sigh of relief and the translocation team is happy that, except for the brief period of excitement towards the end, everything has gone to plan. The story has a fitting end with the news coming in a few days later from the post release monitoring team that the mother and daughter had united and were settling down in their new home. Happy endings happen in the natural world too. A second phase of translocation soon followed in the New Year from 17th to 18th January 2011 and this time a total of 4 rhinos were translocated in one shot that included 2 females, one male and one sub-adult male. 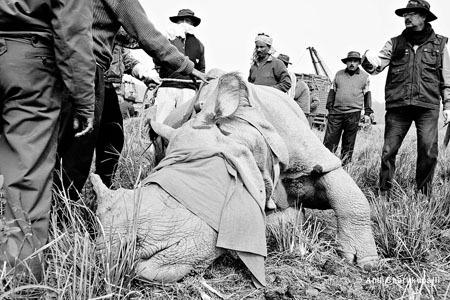 In spite of the huge task of translocating and releasing 4 rhinos, never done before in India, the Translocation Core Committee ensured that everything went without a hitch. Hover your mouse over the thumbnails for photo captions. The IRV 2020 is a joint programme of the Department of Environment and Forests – Government of Assam, WWF-India and the International Rhino Foundation (IRF) with support from the Bodoland Territorial Council, US Fish and Wildlife Service and the local communities. The programme’s vision is to increase Assam’s rhino population to 3000 by 2020, which will be done by wild-to-wild translocation from Kaziranga National Park and Pobitora Wildlife Sanctuary to Manas and Dibru Saikhowa National Parks as well as Laokhowa and Burachopari Wildlife Sanctuaries. Assam accounts for the largest population of Indian rhinoceros. 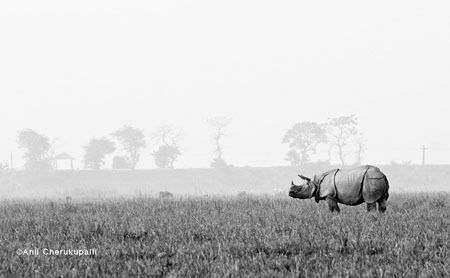 Though rhino numbers in the state have grown from 2000 in 2005 to over 2200 in 2009, more than 90% of these live in just one Protected Area, which is the Kaziranga National Park. The IRV 2020 programme aims to secure the long-term survival of wild rhinos in Assam by expanding their distribution to reduce risks like disease, in-breeding depression and mass mortality. Under this programme, the first phase of wild-to-wild translocations was carried out in April 2008 when two male rhinos were re-introduced into Manas National Park from Pobitora Wildlife Sanctuary. The current translocations are a part of phase two of the translocations. During this second phase, a total of eighteen rhinos are proposed to be translocated from Pobitora Wildlife Sanctuary and Kaziranga National Park to Manas National Park in batches.